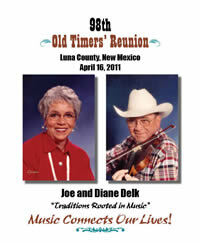 Diane and I have lived in Mesilla Park, NM since 1988. We met while I was a student at New Mexico State University in 1967 and were married in September 1968. I graduated following the fall semester in 1969 and we moved to the family ranch east of Santa Rita, NM where I grew up with my sister Linda (Cox) and brother, Jimmy. My folks were Forrest and Gertrude (Twiss) Delk. Diane is the former Diane Graveline of Deming, NM. Her father and mother, A.D. "Gravie" and Jean Graveline owned and operated Deming Rexall Drug for many years. We raised our three sons Neal (1970), Mark (1971) and Byron (1974) on the 2C Ranch southeast of Hurley, NM and moved to Mesilla Park in 1988. The boys grew up horseback helping with cow works and ranch chores, were active in 4H and FFA showing livestock until they graduated from high school and all became avid hunters in some of the best deer country in New Mexico. The boys and I started playing for dances in July 1984 and continue the family tradition today playing for several special events. I've been the wagon boss for The Delk Band for nearly 31 years and estimate that the boys and I have played for eight to nine hundred dances since we started in "84" not counting the three years the boys played professionally on the road as "The Delk Brothers Band". Diane retired from banking work several years ago and I retired as a sales representative for ADM Alliance Nutrition last year. I remain semi-active in the feed business as a dealer working with several ranchers I've been helping for close to 20 years. I am active on the Dona Ana Soil Water Conservation District Board of Supervisors and Diane is a caregiver for an elderly friend in an assisted living facility in Las Cruces. Our main job today, however, is making sure we don't miss any of our 5 grandson's activities and that in itself is a full time job. We attend all the livestock shows, basketball games, youth shooting competitions and music recitals we can fit in. Neal is married to the former Tandee Bostwick who was raised in Melrose, NM. Tandee's parents are James and Sherolyn Bostwick, 2nd generation dry-land farmers and graduates of Melrose High School. Tandee and Neal first met in 1994 in Albuquerque while Tandee was attending college at UNM. They married in 1998, now have two sons, Teigan (2000) and Tyce (2002) and live just outside of Melrose, NM. Tandee is principal of W.D. Gattis Middle School in Clovis and they own Roper Fence Co. (www.roper-fence.com). Neal services southeast New Mexico working primarily in the Clovis/Portales area but finding much of his work in Roswell and Artesia areas as well. Mark and Stacey met on a blind date and were married in 2010. She is the former Stacey Ogaz from Garfield, NM. Stacey's parents are Edmund and Alice Ogaz, lifelong farmers in the Hatch valley and grow some of Hatch's famous green chile. Stacey has her masters in speech language pathology and works as a Speech-Language Pathologist within Dona Ana County in various settings. Mark is a journeyman electrician with LE Electrical Contractors of Las Cruces. Their family grew on January 13, 2015 with the birth of Easton Edward Delk. Easton was an eight pounder and is our 5th grandson. We could not be more proud. Byron is married to his high school sweetheart, the former Jaylene Tharp of Las Cruces. Jaylene's parents are Rod and Mary Lou Tharp, 2nd generation farmers in the Mesilla Valley. They have two sons, Cody Joe (2002) and Caleb (2005) and live north of Las Cruces. Byron's business is "Axle Surgeons of Southern New Mexico and West Texas" specializing in onsite replacement of damaged spindles on big truck and trailer axles. Jaylene works as an Instructional Specialist at Dona Ana Elementary School north of Las Cruces. Do you want to know when and where we are playing next? Check out our Schedule here! Click to flip through the pages.